Beautiful certificate from Millionaire.com issued in 2001. This historic document has an ornate border around it with a vignette of the company's name with a globe in lieu of an "o". This item has the printed signatures of the Company’s President, Robert L. White and Secretary, and is over 10 years old. The dot.com madness that has boosted stocks such as Millionaire.com mlre (otc bb: mlre - news - people) to stratospheric heights got a reality check this week. The Hilton Head, S.C.-based company has apparently landed in hot water with the Securities and Exchange Commission. The investigation involves a review of the company's past capital raising activities and trading in the company's securities. At middaytoday, its shares were down 88% to $3 a share from an all time high of nearly $27 a share last earlier this year. This is the latest chapter in the colorful saga of Robert L White, the Millionaire.com CEO, and his portal "for the wealthy" that offers auctions, chat rooms and more. Our Internet Web site, located at www.opulence.com, which currently offers, among other things, an online mall where retailers can rent links to their sites and a catalog where individuals can advertise their products and services. We are a development stage company which began to operate in December 1998. The first magazine that we published, was published under the title of Millionaire in February 1999. It was in a quarterly format. Since May 1999, we published Millionaire magazine on a monthly basis combining the January and February issues into one issue. To date, we have published one issue of Billionaire magazine, which was an annual enhanced version of the monthly Millionaire magazine. As of August 2000, we changed the name of our magazine to "Opulence" and no longer publish magazines under the "Millionaire" and "Billionaire" names. In August 2000, as a result of a legal dispute involving the parties from which we purchased the trademarks "Millionaire" and "Billionaire", as detailed below, we decided to change the magazine name from "Millionaire" to "Opulence". On February 1, 2001, we and the Lamberts (as defined below) entered into a settlement agreement related to the trademark dispute. Under the terms of the agreement we agreed to transfer the trademarks, the "Millionaire" and "Billionaire" trade names and certain Internet domain names to the Lamberts in exchange for cancellation of the outstanding note related to the purchase of the trademarks. For the year ending December 31, 2000, we recognized a gain on trademark settlement totaling $274,722. Douglas and Jenny Lambert (the "Lamberts") owned all of the stock of LifeStyle Media Corporation and individually owned the trademarks "Millionaire" and "Billionaire" ("the Marks"). LifeStyle Media Corporation published the Millionaire and Billionaire magazines. On or about August 14, 1998, a stock purchase agreement was executed (the "Transaction") between Lifestyle Media Acquisition Corporation ("LMAC"), our wholly-owned subsidiary, whereby LMAC acquired all of the Lamberts' stock in and to Lifestyle Media Corporation. As part of the Transaction, the Lamberts executed an Assignment of Trademark, assigning to Lifestyle Media Properties, Inc. ("LMPI") all of the Lamberts' right, title and interest in the Marks. As part of the Transaction, LMAC executed a promissory note in the principal sum of $1,674,595.00 payable to the Lamberts ("Note"). LMPI also executed a Trademark Security Agreement and LMAC executed a Pledge Agreement as part of the Transaction. The Trademark Security Agreement grants the Lamberts a security interest in the Trademarks to secure the performance of certain of LMAC's obligations in the Note and Stock Purchase Agreement. The Pledge Agreement grants the Lamberts a security interest in the LMPI stock to also secure payment of the obligations contained in the Note and Purchase Agreement. By letter dated June 30, 2000 we were notified by the Lamberts that the Lamberts had seized the LMPI stock under the Pledge Agreement and voted those shares to cancel all agreements between LMPI and our company to use the Marks. The stated reason for the Lamberts' actions were alleged violations by us of the agreements , including failure to adequately protect the Marks from infringement. Under the agreements, we were required to protect the Marks from infringement, misappropriation and dilution, but had no obligation to pursue claims that we believed to be of negligible economic value. We reviewed the Lamberts' contentions in light of the contractual obligations and found them without merit. In particular, we advised the Lamberts that there had been no monetary default in the payments under the Note and that we had taken all steps we believed to be reasonably necessary to protect the Lamberts' collateral (the Marks). We viewed the actions taken by the Lamberts as wrongful and in violation of the contractual agreements between us and the Lamberts. Claiming damages for the wrongful seizure of the Pledged Stock of LMPI, we did not make the August 14, 2000 Note payment to the Lamberts. It was our position that the damages we incurred for the wrongful seizure of the stock far exceeded our obligations under the Note. On August 31, 2000, we brought an action in the United States District Court of Nevada alleging breach of contract and intentional interference with contract in connection with the Lamberts' transfer to themselves of stock in LifeStyle Media Properties which holds the trademarks, Millionaire and Billionaire, in violation of the Pledge and Security agreements among the parties. On October 16, 2000 in the District Court of Clark County, Nevada, we brought a state court action in anticipation that the federal court action detailed above would be dismissed in the near future for lack of subject matter jurisdiction. We asserted claims for damages and recovery of the Marks arising from the same facts detailed above. 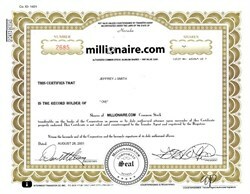 In February 2001, we came to a settlement with the Lamberts whereby we agreed to transfer the trademarks, the tradenames Millionaire and Billionaire and relinquish the use of www.millionaire.com, www.millionairemag.com, www.millionaire-magazine.com in return for the Lamberts agreement to forfeit the balance of the $1,674,595.00 plus any interest accrued. We had already changed the name of the magazine to Opulence and had established its Web site at www.opulence.com. taking advantage of the cross-promotional opportunities that these varied distribution channels provide for marketing our products and services. In January, 2001 we closed our Global Auction facility, without recourse from our Landlord, moving our offices into two office buildings within the same complex. Holding auctions in the Bluffton/Hilton Head area proved to be unsuccessful in that the influx of new residents were, for the majority, selling rather than buying fine art and antiques to conform themselves to what the coastal lifestyle called for, a less formal environs. We were incorporated on February 15, 1995 under the laws of the State of Florida as World Circle Trust Fund, Inc. On November 3, 1995, we changed our name to Charter Investor Relations of North America, Inc. On November 24, 1998, we changed our jurisdiction of incorporation to Nevada and we changed our name to Millionaire.com. On December 15, 1998, we acquired Life Style Media Acquisition Corp. ("LMAC") which published magazines, including Millionaire magazine and Billionaire magazine and Life Style Media Acquisition's wholly-owned subsidiary, Life Style Media Properties, Inc., ("LMPI") which holds the trademarks for "Millionaire" and "Billionaire." Prior to the purchase of LMAC, we did not conduct any business. On July 20, 1998, we formed U.S. Auctions, Inc. a Delaware corporation and wholly-owned subsidiary. Our headquarters are located at Bldgs. 7 and 10 - Plantation Park Drive, Bluffton, South Carolina, 29910, and our telephone number at that office is (843) 757-6600. Our website is located at www.opulence.com. Information contained on our website does not constitute a part of this Annual Report on Form 10-KSB. The centerpiece of our business is our magazine, Opulence. Through our wholly-owned subsidiary Life Styles Media Acquisitions, we purchased Millionaire magazine in an effort to accelerate our entry into the market as a provider of luxury goods and services. At the time of purchase, the magazine was a quarterly publication, sold only through newsstands. It had a circulation of approximately 52,000 copies every three months. increased our advertising revenues from $344,316 during 1998 to $2,585,034 during 1999 and in the year 2000 increased our advertising revenues from $2,585,034 to $3,431,085. Starting in July 1999, we published Millionaire on a monthly basis printing eight issues through December 1999. During the year 2000, we published 7 issues of Millionaire and 3 issues of Opulence, the new title for the publication. Prior to our acquisition and publishing of Millionaire, 50,000 copies were being published on a quarterly basis for a total of 200,000 copies in 1998. Following our acquisition and publishing of Millionaire, 100,000 copies were published monthly (for eight months during 1999) for a total of 800,000 copies. During the year 2000, 495,800 copies of Millionaire and 130,000 copies of Opulence were published. In comparing the change in revenues resulting from our transition to a monthly format, in 1998, the quarterly Millionaire magazine generated a total of $320,000 in revenues; in 1999, $2,828,000. and in 2000 $3,837,000. We continue to provide entertaining and informative editorial content to the reader who leads or aspires to lead a lifestyle of luxury. Our articles focus primarily on the lifestyles of successful people. We continue to broaden the editorial content to include new features of interest including investment strategies, fashion, fitness, technology and collectibles. The magazine also serves as a venue for the sale of luxury products that we have acquired at favorable prices or through barter arrangements. Design. Opulence's design conveys a luxury image. Opulence magazine is printed in four colors throughout. The paper used for printing the interior pages is a high quality 60 pound enamel paper (60 pound means that 500 pages of the 25" x 38" paper used weighs 60 pounds). The cover stock (paper) is a much heavier 100 pound product manufactured with a high gloss finish. The magazine is "perfect bound," which means the individual pages are glued to the cover rather than the less desirable and less expensive "saddle stitch" where pages are stapled to the cover. These components combined add both cost and quality to the publication. The ratio of editorial pages to advertising pages is maintained between 25%-30% editorial to 75%-70% advertising. As more advertising pages are sold, the percentage of editorial pages increase at the same ratio. The number of pages has been increased to almost 300 to accommodate additional editorial features and advertising pages. Editorial Content. Opulence has traditionally been a guide for enjoying a luxury lifestyle. Though we have maintained many features and departments of the magazine's editorial content, we are expanding such content to cover people-based stories, rather than the traditional place or product- based approach. We are featuring articles about the backgrounds and lifestyles of the owners, operators, and managers of major businesses. These articles describe entrepreneurs' road to success, for instance, and their luxurious lifestyles. We are continuing to feature our travel and resorts sections, and have added new departments covering investment information, financial advice, fashion, food, wine, health, fitness, technology, antiques, and many other popular categories. Each article references how to access the products or services described. Most feature writers are freelancers located around the world. Articles are approximately 600 words and include photographs. Most advertisements are four color, full-page ads. The magazine offers nine advertisement sizes, ranging from two page spreads to a 1/6th of a page ad which is specifically targeted to "for-sale-by-owner" advertisements where readers can present their own homes, cars, boats, planes, and antiques. We have been offering discounted introductory rates to all first time advertisers in order to more rapidly increase the number of advertising pages. There will also be special incentives for advertisers who pay up-front. We believe Opulence's advertising rates to be relatively low compared to other advertising rates in the luxury magazine segment; however, we expect that the demographics of Opulence will translate into premium rate advertising over time. Currently, the cost of a full page in color advertisement in Opulence runs under $10,000, compared to $13,000 for Robb Report and $69,000 for Vogue. We believe this disparity in cost gives us latitude to increase rates without depressing demand for space. Current Opulence advertisers will be converted to a new rate schedule at the time of contract renewal. Subscriptions/Memberships. We target a selective group of extremely wealthy clients providing them with a broad range of luxury products and services. We have approximately 4000 subscribers. Subscriptions to our magazine are available at $75 per year for 12 issues. We generate subscription and membership sales through public relations efforts, the media, the return of magazine inserts from single copy sales ("blow in" cards), direct mail targeted at our proprietary mailing list, advertising in other upscale periodicals often through barter arrangements on a no-cash cost basis, selected television and radio advertising, advertising on the Internet both through our own website and through other upscale websites, often utilizing barter arrangements with these other sites. Book Store Distribution. We also distribute Opulence magazine through book store sales, which also serve as an important marketing tool. We have improved our approach to distribution by focusing on bookstore sites located in affluent areas. Opulence can be purchased in Barnes & Noble, Borders, and Waldenbooks. In order to expand circulation, our direct mail campaign is providing Opulence, free-of-charge, to selectees from a database of approximately 450,000 individuals in the United States with an average net worth in excess of $9 Million. Through mailings, public relations campaigns, media advertising, responses from magazine inserts, direct mail solicitation, obtaining proprietary mailing lists, and advertising on the Internet (both at our own website and other upscale websites), our target is a 200,000 paid subscribers although there is no guarantee that this number can be reached. We believe increased circulation will attract new and repeat advertisers, which can result in increased advertising rates.